Our black Angus and Wagyu beef cattle are 100% grass fed, grass finished. Our pastures and animals are certified organic- we use no growth hormones, no antibiotics, no fertilizer other than that which is supplied by our animals. Our animals are pasture-raised where they socialize with the other cows, turning the lush green organic pasture into delicious meat. In the winter, our animals are provided our own organic hay. In the winter, the cattle still have room to move around, and have access to plenty of fresh water. We rotationally graze, allowing them to get the best of each pasture. We wet wrap our hay to maintain the most nutrition as we can provide for the winter months. Our cows give birth in the pastures, we only assist with births when necessary. Hanappe Ranch uses weaning rings to allow calves to stay with their mothers as they make the transition to their all grass diet. Our bulls remain bulls, no castration. Animals are harvested at around 32 months as opposed to 20 months for grain finished cattle, allowing time for the fat marbling to develop. Two beautiful bulls getting ready to be loaded into the trailer. All of our calves have arrived. Below is an August photo of a milk faced bull calf. Our pastures are not quite ready for our animals, although it is looking greener everyday. Despite no pastures, we had our first 2 calves of the year. The first calf seems to enjoy bopping around the corral running circles around its mom. 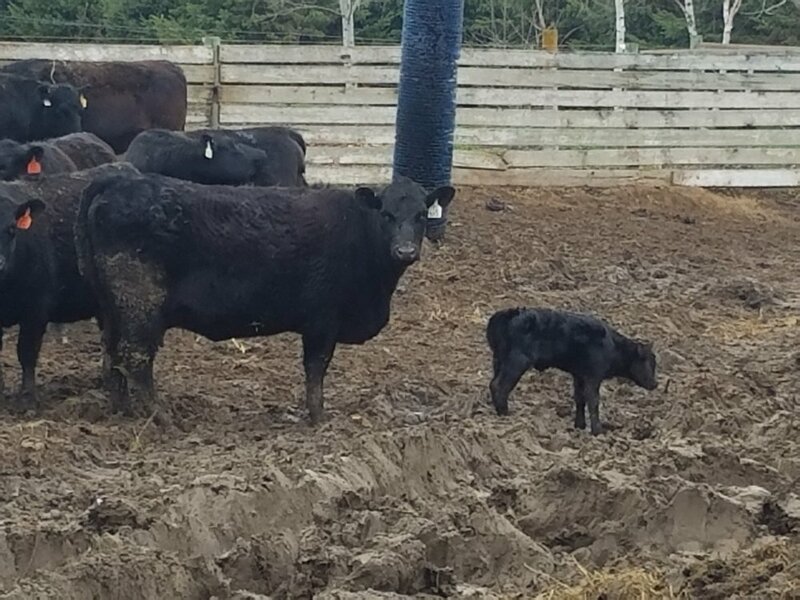 First calf of the 2017 season. If you are interested in more information about our cattle, our ranch, or ordering, please contact us below.